The recent battle for Aleppo has the potential to tilt the balance of power between the warring parties in the region. The outcome can have far-reaching consequences, not only for Syria’s future, but also for the wider region, and eventually for Europe and its Western allies. Since 2012, Syria’s largest city has been divided in two, with a western part controlled by the government and an eastern part controlled by a mostly moderate part of the opposition. The opposition further controlled a corridor to the Turkish border, important for resupply and Turkish support. The rebel-controlled area was seen by the West as the “good rebels” useful in the fight against Daesh (also known as the Islamic State or ISIS) and for a Western vision of the solution to the conflict. However, over the last six months, Aleppo has seen infiltration from jihadi-extremist groups, which might have legitimized the recent regime offensive towards the city. With air support from Russia and Iranian and Hezbollah militias on the ground, the regime has seen more advancement in just the last few months than it has over the previous years. The support lines from east Aleppo to the Turkish border have been broken. There is still access to Turkey through Idlib, but this route is more complicated, as it goes through areas controlled by the al-Qaida affiliated Nusra Front. Parallel to the regime’s progress in and around Aleppo, the Syrian-Kurdish militia has advanced both against moderate rebels towards west, north of Aleppo, and towards east against Daesh. The Kurds are key to supporting the USA-led coalition against Daesh, as the only force on the ground. Their expansion west, however, is seen as an existential threat by Turkey, since it would unite Kurdish areas and strengthen their position. Turkey is a NATO ally, and supposedly an ally of the fight against Daesh, yet Turkey’s own Kurdish population has long struggled for independence or increased autonomy, aspirations that are brutally crushed by Turkish security forces. As a consequence of the Syrian Kurdish advances along their border, the Turkish army has shelled some Kurdish bases south of the strategic town of Azas inside Syria. At the same time, the Kurds have a historic relationship with Russia, dating back to the Soviet era when it supported a Kurdish republic. It seemed not to have included military cooperation. Yet, Russia has so far not bombed areas controlled by the Kurds, which have led some opposition groups to seek shelter in these areas, and some groups have even surrendered to the Kurds, which they see as a better alternative than to surrender to the regime. For the Kurds, one of their main achievements beside military advancement is to put Kurdish issues back on the international agenda. The recent weakening of the moderate opposition and the loss or minimized access to Turkey could further limit Turkey’s role in an eventual political process. After 30 years of conflict, a ceasefire between the Turkish government and the Kurdish Worker’s Party (PKK), which has been in place since 2013, was cancelled. Kurdish areas in Turkey are again exposed to daily clashes between Kurdish militias and Turkish security forces. The country has also experienced several deadly terrorist attacks on their soil. Together with the advances of the Kurdish army across the border and the Russian support of al-Assad, whom the Turks want to oust, Turkey is increasingly more aggressive in its rhetoric. Turkey suggests a no-fly zone along their border with Syria and a ground operation with the support of Saudi Arabia. However, a no-fly zone is problematic at this stage of the Syrian conflict, since Russia now is using the air space for their operations in Syria, and probably would veto such a proposal in the Security Council. A joint ground operation also appears unlikely, since Saudi Arabia seems reluctant to take part. That the bombing of Aleppo started when peace talks were attempted in Geneva was no coincidence. The advances in Aleppo has bolstered the Syrian regime, and Bashar al-Assad has publicly announced that he aims to retake all of Syria, although he admits it will take a long time. The attacks on mostly moderate rebel areas in and around Aleppo seems to have created a vacuum being filled rapidly by more extremist jihadi groups. Such a development suits Bashar al-Assad because it further legitimizes his more brutual attacks on these areas. If the dramatic weakening of the moderate opposition continues, it would leave only two relevant stakeholders for Syria’s future: al-Assad and Daesh. The West has officially rejected both, but reluctance and slow action have diminished alternative options. It might leave al-Assad as the only feasible solution for Syria if the choice is between him and Daesh. This move has effectively sidelined Western ambitions for a third solution for Syria, which includes the moderate opposition and an end to the al-Assad regime. Simultaneously, it has brought Russia back as one of the main actors in international politics. The Russian Foreign Minister confirmed this in a press conference on January 26th by saying that the time when Russian interests could be ignored was over. While Russia is still committed to fighting terrorism in general, and to find a political solution for Syria in particular, their message is that this has to be done with Russia and the West as equal partners. Yet, Russian ambitions in Syria can be expensive, and come at a time when Russia’s domestic economy is challenged by a decline in oil prices, and a costly engagement in Syria could quickly become domestically unpopular if it starts to resemble the previous Soviet quagmire in Afghanistan. Further, while the majority of Russia’s 20 million Muslims are Sunni, it can be difficult to explain promotion of Shia interests in Syria. It thus seems that Russia is aiming at a balancing act in its Syria engagement; while giving air support to al-Assad’s ground operations, Russia has simultaneously been remarkably receptive to cooperation with the USA at the UN. They agreed on the Syria resolution in the UN Security Council last December to start negotiations in Geneva this February, and although the negotiations were quickly postponed, they have also proposed a “nationwide cessation of hostilities.” There is still confusion around the implementation of the ceasefire, although on Sunday, US Secretary of State John Kerry and his Russian counterpart Sergei Lavrov said they had reached a provisional agreement, including a cessation of hostilities between all the warring parties except Daesh and the Nusra Front to start on Saturday March 27th. There is cautious optimism that this could mean a start of a more solid peace process, but realistically, it will only mean a lull in the current offensive. There are further doubts about Russia’s motives behind their suggestion for a ceasefire; one fear is that it is serving as a cover up for their continued military actions in Syria, which eventually will make the moderate opposition irrelevant for a future solution for Syria. 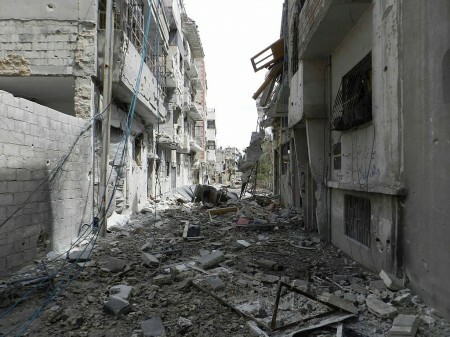 The good news is that these developments already have facilitated humanitarian aid access to besieged areas in Syria. Yet, a severely deteriorated security situation in northern parts of Syria is sending new flows of refugees towards the Turkish border. Systematic attacks on health facilities in the region are limiting life-saving service opportunities for hundreds of thousands of civilians. It is further reported that most education facilities have stopped their service. By now, more than 330,000 have been forced to flee from Aleppo and the surrounding area during the last six months, and a survey by Reach claims that between 50-70 percent of the remaining population plans to do the same if the situation escalates further. While the European Union and Turkey have been negotiating a generous aid package to Turkey in return for restriction of the refugee flows to Europe, that level of increase could jeopardize these efforts. If Europe sees an escalation in the refugee flows, it could destabilize European unity, a development that might strengthen Russia further in their aim to regain a role as one of the world’s superpowers. Mona Christophersen is a researcher at the Fafo Foundation. Her research expertise include Palestine, Lebanon, and refugee livelihoods.